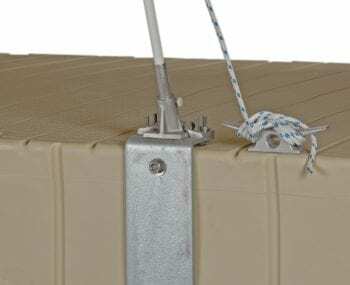 The EZ Port® MAX is the first lift to be Modular for multiple configurations to fit your needs, Adaptable to accommodate varying waterfronts, watercraft and anchoring needs, and finally, eXpandable to allow for in-line tandem porting. Various configurations are possible with EZ Port® Max. 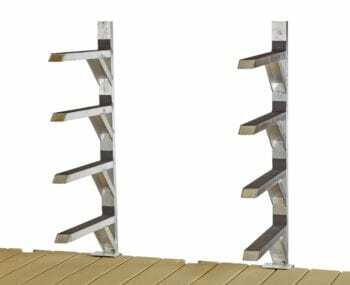 It can be used with standard EZ Dock, traditional fixed or floating docks or freestanding. EZ Port® Max is adaptable to your waterfront situation and watercraft. Have more than one water craft? No problem, EZ Port® Max is expandable to allow multiple in-line tandem configurations. Entry sections may be used “head-to-head” for a drive-thru configuration. This system uses one size fits all roller system and is enhanced to fit and match a wide rande of watercrafts. EZ Port® Max has lower entry roller for easy approach and softer entry, loading and unloading. It is also available in multople colors.